We spent March 27th doing a photoshoot on our roof with the autumnally inclined Idil Sukan, where I got to spit on Luke (like this) quite a bit and Idil snaffled many lemon bars that I had made. 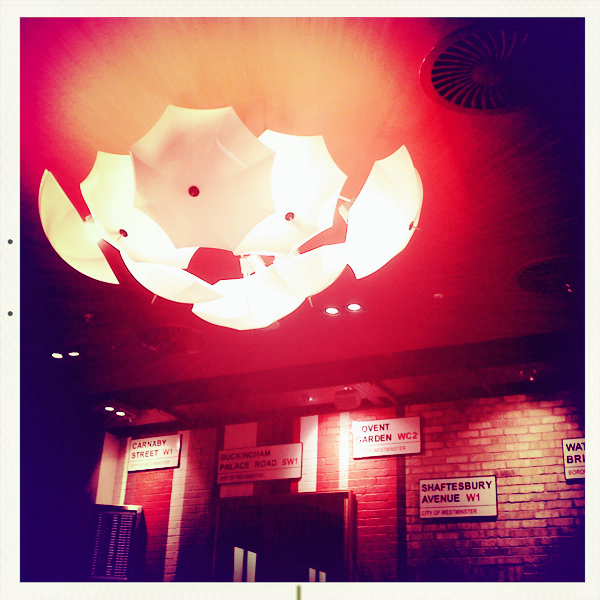 We then had a Pizza Express dinner before packing for our trip. The taxi was coming to pick us up at 4am. There was obviously no way I would get any sleep because I was pumped full of Pocky based excitement. We arrived to a sleepy Heathrow Terminal 4 & checked in. It was only at this moment that I relaxed about the flights. I’d bought them online from Travelup.com and had convinced myself it was all a scam & when we got to the airport the check-in staff would look at me with pity and amusement before telling me I just paid some bloke in Hull £1200 for nothing. IT WAS OK, GUYS! Turns out you can buy mega flights without actually receiving anything in the post. Isn’t the future cool? Not much was open so we opted for breakfast in the place that had the most satisfying pun in the title that was also open. 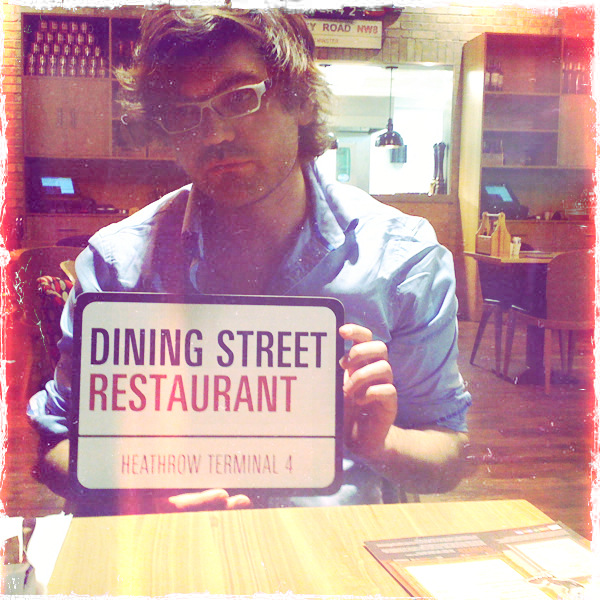 (My favourite breakfast ever was from Armadillo in Gatwick North – I dream of it still. But tragically, no Armadillo in HT4.) Step forward “Dining St Restaurant”. A few eggs down and we were on our way to board a Qatar Airways flight to Doha. I’d spent AGES looking up flights and the airlines we could’ve chosen. I opted for QA as their reviews were the best and I’ve never been to Doha so I can tick that one off the list. Also, they had a WINE LIST. In ECONOMY. I was sold. I’ve never flown long haul before and I actually love flying so this was a real treat for me. I also love being given food at regular intervals, watching films and cramped spaces – so a long haul flight is almost enough to make me sick with joy. In our little bags they gave us (with sleeping mask, toothbrush etc.) they had these stickers -> the missing one is “please wake me for meals” because THERE IS NO WAY I AM MISSING ANY MEALS. The food was actually pretty good and I watched a couple of films after waving goodbye to Blighty out of my little window. 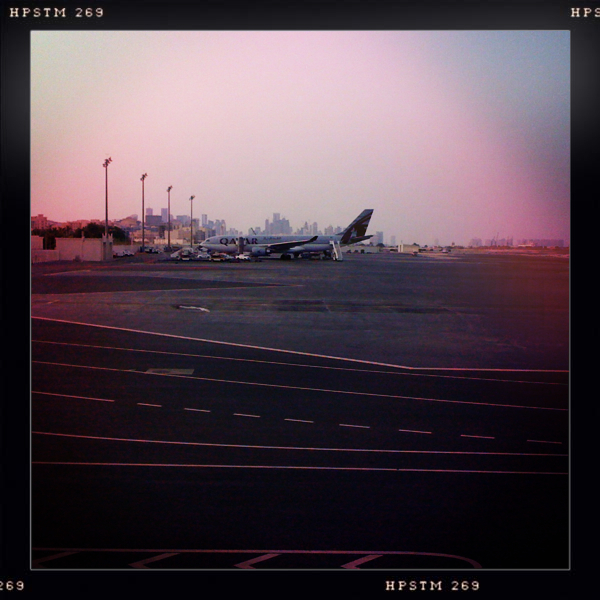 We landed in Doha for an 8hr stopover. If we’d been in fancy-pants class, I think we would’ve been taken to a hotel in Doha for those 8 hours. As plebs in economy we opted to stay in the airport & pay the $40 to use the Oryx Lounge. This lounge included unlimited food & drink, including boozy drinks – it was quite hard to find a member of staff to get you a boozy drink. When I did find one, they made my gin and tonic equal parts gin and tonic using a full mini can of tonic. They also had showers and free wi-fi. It was pretty good. It was basically like being at home, but with a butler to get you boozy drinks and international business people hanging around. The second leg of the flight was a code-share with ANA. This meant Japanese food AS WELL as Western food offered on the menu and wonderful, wonderful Japanese flight staff. This was where we first started seeing people wearing face masks (it’s apparently common in Japan – for hay fever, colds etc). 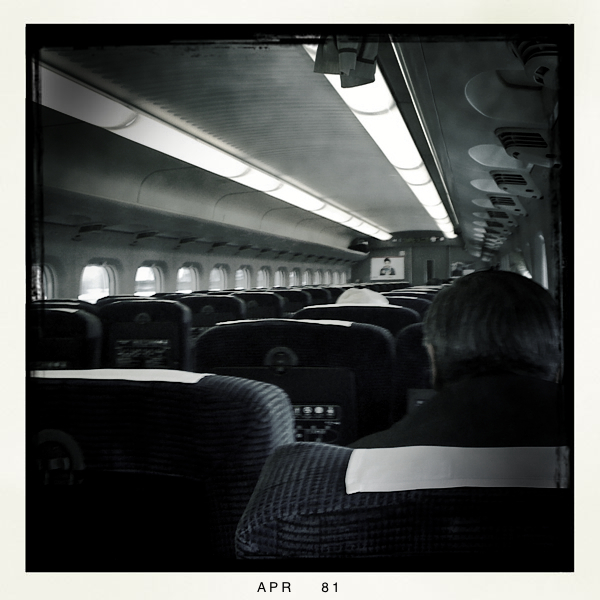 I think we were the only gaijin on the flight, and there were plenty of seats free. Our first experience of the gaijin exodus of Japan. We landed on the amazing man-made island that is Kansai International Airport. We had our thumb prints electronically scanned (THE FUTURE, ARGH) and got through immigration fairly easily, particularly as there was LITERALLY NO ONE ELSE in the non-Japanese queue. It was pretty weird. We felt very self-conscious and knew that people were surprised but also pleased to see we’d not been deterred from coming to Japan despite the terrible disasters. Though when we told the woman on the desk we were headed to Tokyo she did a ‘best of luck!’ type face at us. At that point the foreign office were still advising against travel to Tokyo, but you know what? Your ‘advice’ can’t stop me, Foreign Office – even if it does invalidate my travel insurance. Gliding through the shiny airport we found the JR office where we could pick up our JR passes. It was fairly simple and the dude was super nice. He sorted out our passes, reserved seats on the next train to Shin-Osaka and gave us directions to the correct platform. He then stood up and did a big thank-you bow. We found the platform where 3 things blew our minds. 1. Pocky in the kiosk. We bought it. 2. The train was there waiting with a red rope across the doors and a guy cleaning it – including the windows. And doing a bloody good job of it. I don’t think I have EVER seen a British train being cleaned. 3. The seats on the train all magically turned around to face the direction of travel. AMAZING. The cleaning guy stood in the door, waited for an announcement, bowed and took away the rope. We chugged off the island towards Osaka with the sun setting behind us. 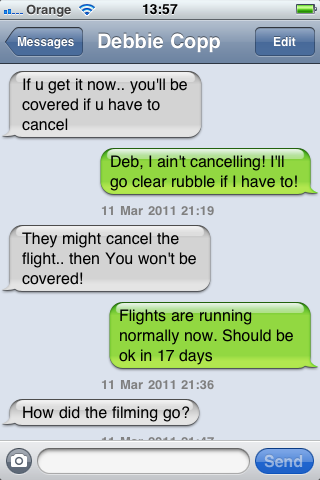 We booked our flights on January 30th 2011. 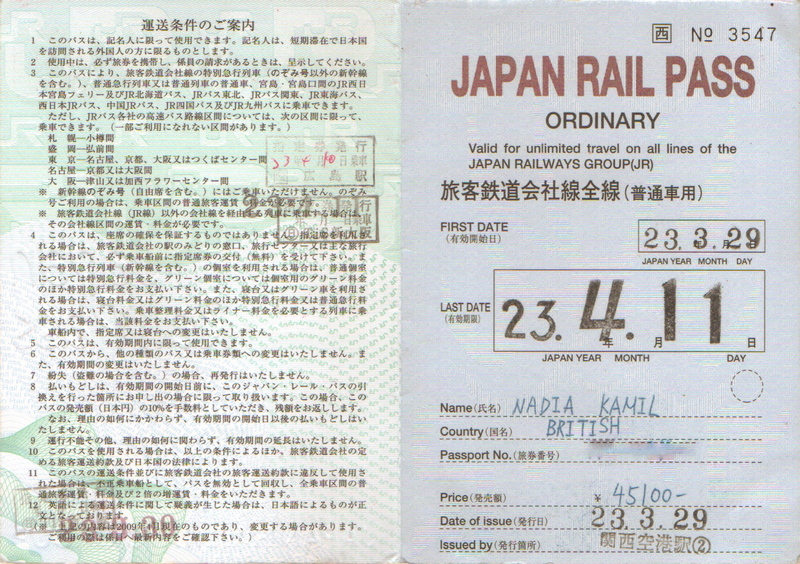 Departing from London for Osaka on March 28th & leaving Japan on April 11th. I spent the next weeks feverishly researching our trip, booking ryokans and hostels, buying our rail passes and generally being too excited to sleep, repeatedly muttering “we’re going to Japan!” into my boyfriend’s ear. He wasn’t so keen on that. Then on March 11th, with 17 days to go, the most powerful known earthquake ever to have hit Japan, and one of the five most powerful earthquakes in the world since modern record-keeping began in 1900 struck off the east coast of central Japan. If that doesn’t sound bad enough, it was officially an “undersea megathrust earthquake” which sounds Bond-villain level of evil. The quake was so mega it shifted the whole island a few metres east and altered the the Earth’s axis by a few inches. The resulting Tsunami reached heights over 40m and travelled as far as 6miles inland. Due to clever planning and building regulations, the earthquake itself caused surprisingly limited damage (for the biggest quake ever, you know). However, the size of the tsunami was unprecedented and it caused devastating damage across great swathes of the east coast of Japan. Around 20,000 people were killed or remain missing. Entire towns were washed away. 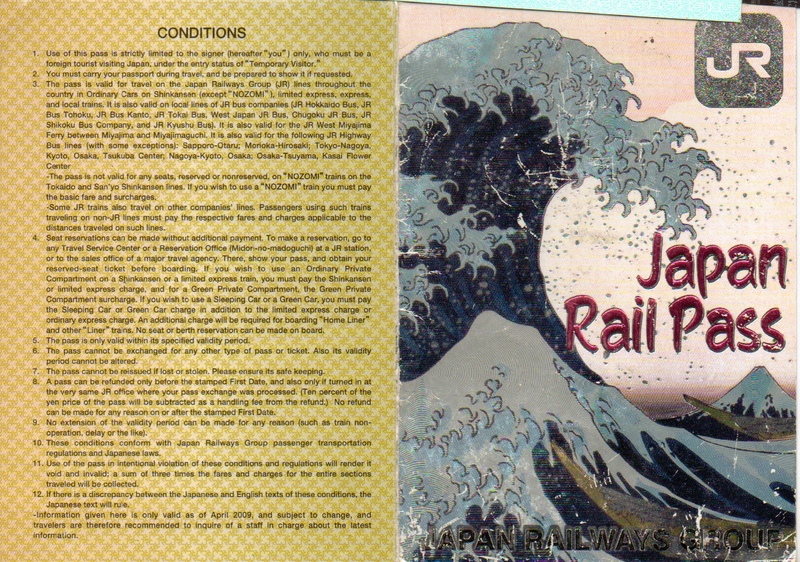 It was the greatest disaster to hit Japan since WWII. As you can imagine, it was a mega bummer for me and my holiday plans. I spent the first few hours trying to contact my friend in Tokyo to check she and her family were all ok. I then spent the next few days watching NHK non-stop. My heart was broken for Japan. It was worse than any disaster movie I’d seen. The footage was crazy. 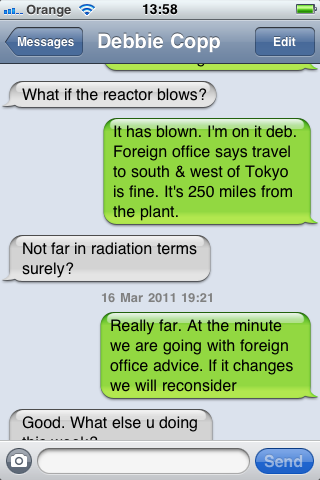 Then the nuclear problems started to come to the fore. There was a feeling of distrust between the public, TEPCO, the government and the press (local & international). It seemed no one trusted the energy company and the nature of a “nuclear crisis” resulted in a deeply unsettling sense of fear and uncertainty. 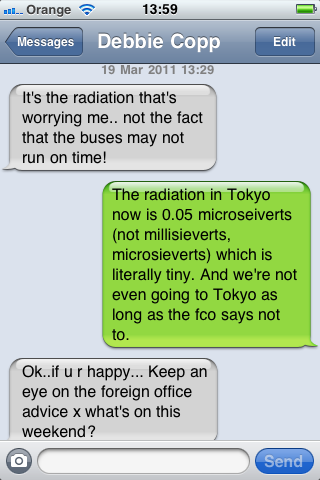 I learned more about nuclear power & radiation in those 17 days than I ever thought I’d know. 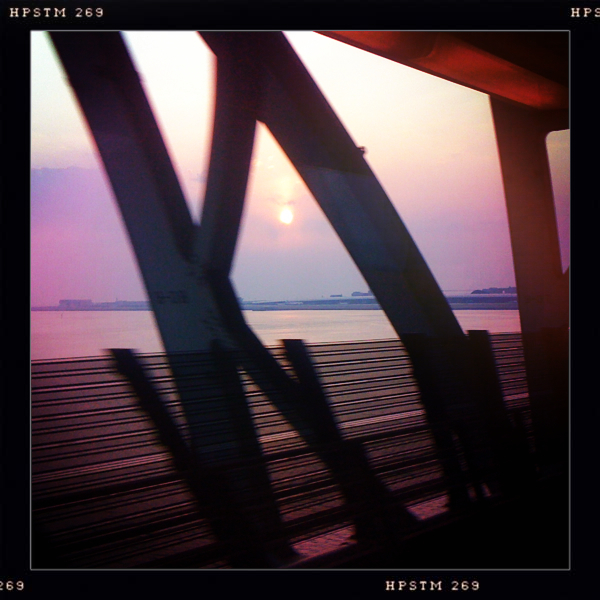 My friend in Tokyo relocated to Osaka with her dad. Her mother and sister flew back to Holland. At that stage we kept checking with the Foreign Office to see what their advice was (they advised avoiding Tokyo and the entire quake-affected area). As our flights were to Osaka, we figured we’d still go to Japan, but alter our plans re: Tokyo. 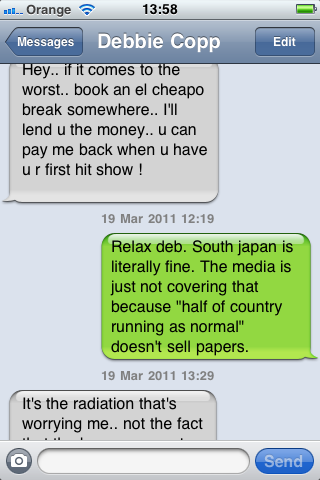 My thinking was that Japan needed our tourist dosh and if the south was unaffected then it’d be stupid not to go. My aunt was freaking out about us going and demanded we take iodine tablets to protect against radiation. She even offered to pay for us to go on a cheap European holiday instead. 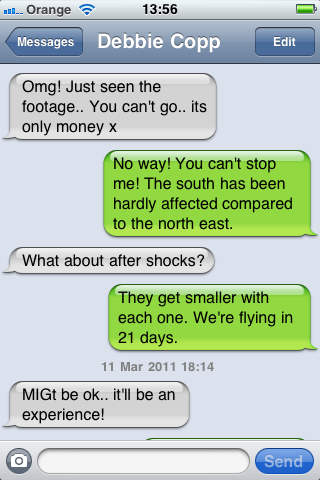 These texts document her worries & overuse of “omg” & me incorrectly counting the number of days til we were due to fly. I’d been in touch with my friend who was now in Osaka. As the situation began to slowly stabilise she planned to head back to Tokyo. 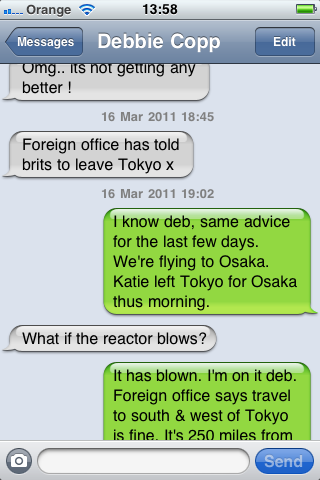 The Foreign Office was still advising against travel to Tokyo, but as I really wanted to see my friend and Tokyo – we decided that if she thought it was safe enough, we’d go with our original plan to fly to Osaka, and travel to Tokyo the next day. We’d stocked up on kelp tablets (a natural form of iodine) to reassure our worrying family and prepared to pack for our uniquely timed trip.